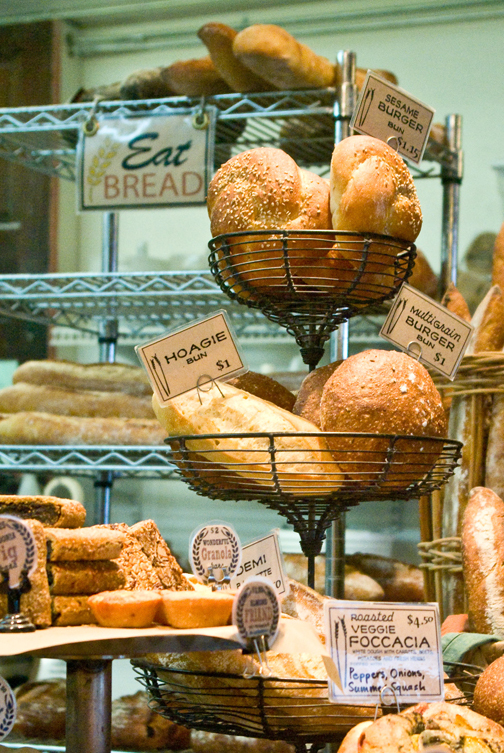 You probably don’t need me to tell you about the Breadfarm and how great it is. Since this artisan bakery set up its storefront in Edison in 2003, they have developed a loyal following from all over the northwest. Baker Scott Mangold and his wife Renee Bourgault, in their effort to create an old-fashioned neighborhood bakery in a rural town, have contributed heavily to the renaissance of Edison as a food mecca, as well as producing the best bread in the county. 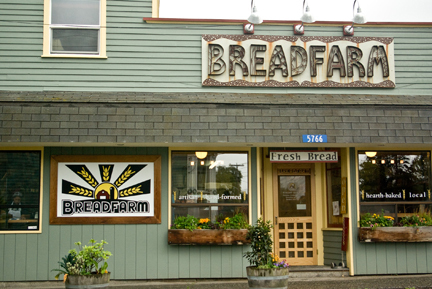 When the Breadfarm first opened it was a breath of fresh air for bread-starved locals. True, we still had La Vie en Rose at that point (before they closed their Anacortes bakery), but Northcoast baguettes had vanished and no-one would deliver Essential Bakery products this far north. My husband and I would bring home loaves of bread from Anjou Bakery every time we visited my parents in the Wenatchee Valley, but otherwise had no good source of crusty sourdough. Then came the Breadfarm and their perfect Bow Hill Baguette, with its thick crust and sour, wheaty flavor, providing the perfect vehicle for a spreadable cheese or fresh farmstead butter. Their other breads turned out to be just as good, from the Baker White to the multigrained Farmer Bread, or the dense, moist Tonasket Rye, ideal for eating with pickled herring or gravlax. All are well made, with the flavor that comes only from good ingredients, natural yeast and a long rise. 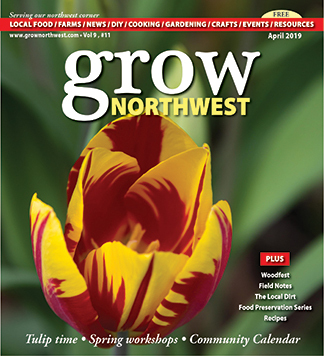 Mangold and Bourgault try to source locally whenever possible, using Skagit Valley potatoes for their moist potato bread and cornmeal from Burlington-based Fairhaven Mills for their multigrain. Wheat, of course, is not easily available from Western Washington growers as of yet, but Mangold has been working with WSU researcher Dr. Stephen Jones on the baking possibilities of new wheat varieties that may do better in this climate. 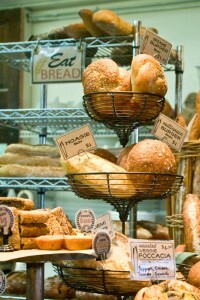 Local ingredients often appear in seasonal items such as allium bread, which is possibly my favorite Breadfarm product. Every summer when this bread appears I have to get a loaf, no matter what else I’m eating. Studded with soft roasted leeks, onions, garlic or whatever alliums happen to be in season, the bread is amazing with sweet butter or eaten plain. Other specialty breads include Sour Cherry Lemon Bread and Fig-Anise Panini, plus a very fine Challah on weekends. In addition to their excellent breads, the Breadfarm also bakes cookies (including the best macaroons in the world, and their amazing salted cocoa nib shortbreads), crackers, dog treats, and granola. Although my nut allergy prevents me from having an opinion on their granola (or, sadly, the hazelnut espresso cookies), I have heard many people rave about it. However, I have been pleased that the Breadfarm takes care to prevent contamination of its nut-free products, and I’ve never had a reaction from their other foods. The bakery does offer a few condiments for sale as well, including Valencia peanut butter, lemon curd, and seasonal fruit jams or preserves, all made in-house. If these don’t fit your mood, you can always head next door to Slough Food for cheese, butter, salami or a bottle of wine. Breadfarm bread is available at retail outlets in Skagit, Whatcom, Island and Snohomish Counties, at their bakery counter in Edison, and at seasonal farmer’s markets from Bellingham to Oak Harbor – particularly appreciated by those of us addicted to their macaroons, which are otherwise only available at the bakery. 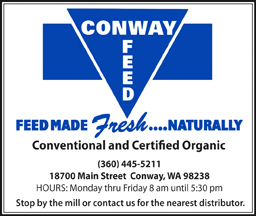 In addition to supporting local markets, they donate to many local charities and organizations, and are now supplying rolls for the La Conner School District, providing a local, wholesome product for school lunches. This really is a place where food and community come together. 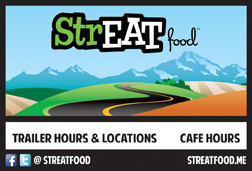 Breadfarm is located at 5766 Cains Court in Bow. 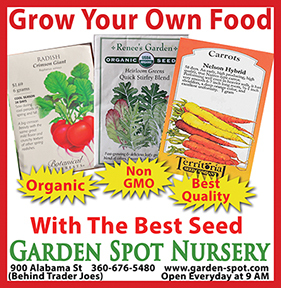 Hours are Sunday 10 a.m. to 7 p.m., Monday through Friday 11 a.m. to 7 p.m. and Saturday 9 a.m. to 7 p.m. 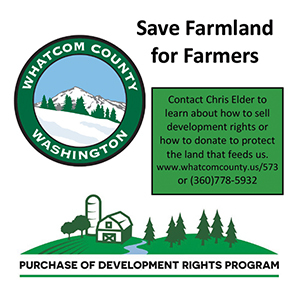 Call (360) 766-4065 or visit breadfarm.com.